We all experience episodes of ‘tonal envy’. You’re a light, and you really want to experiment on the ‘dark side’. You’re a soft, and you crave that ‘pop’ of brightness. You’re a cool, and you want to feel the warmth on your skin of the Spring and Autumn tones … just for one day. Sometimes it’s not even a case of tonal envy. You simply cannot find the piece that you need – that top, the perfect bottom, the coat, scarf, shoes, bag, earrings – to finish off your hard-won tonal ensemble (often as much because you don’t just have to find your colours, you also have to find your style). We all make compromises because we have to … and mistakes, because we are only human. We sometimes lash out in tonal rage and purchase what think we want, only to discover that we have fallen back into the same old pre-PCA trap – this won’t work with that/I can only wear that if I do this/I have to be feeling (happy, sad, excited, approachable) to wear that. At the last TCI Australian Analyst Conference we workshopped the dilemma as outlined above and came up with a concept that we like to call ‘The 90/10% Rule – How to Cheat and Not Get Caught’. The process went a little something like this: each analyst brought and/or wore their perfect colours to the workshop (100% in other words). We then proceeded to swap items with each other to see what, where, and how we could dip into each other’s colour spaces (having one analyst from every tone except BSP and TSu really helped) before we started to perceive the effects of tonal disharmony in each new outfit created. Two interesting things emerged: that success or failure depended on 1/ what tone the ‘cheat’ colour came from and 2/ the choice of colour itself. We tried this experiment over and over with the different analysts and what we found – consistently – was that the further removed you got from the home tone the worse and more noticeable the disharmony became. All of our 90/10% combinations worked quite acceptably. Our eye and brain connected the dots and the cheat colours didn’t seem to matter so much. In other words we respected 90% of the tonal needs and only cheated with only 10%, to put a rough figure on it. As an example here is Claire. 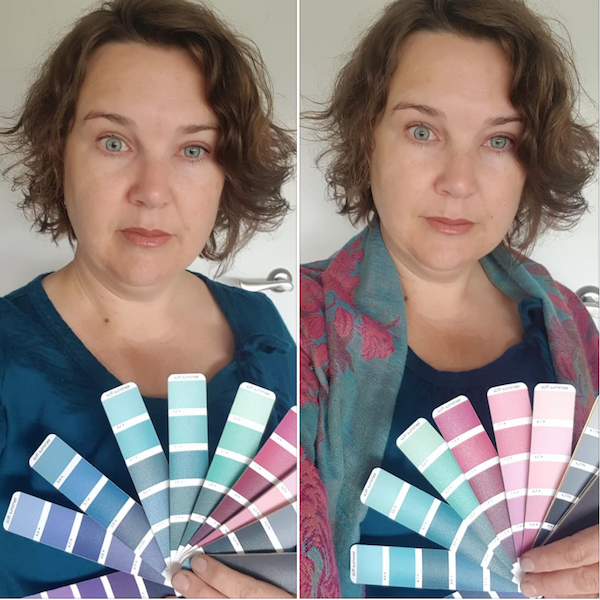 She purchased a top that was a perfect fit and material but felt (as a TCI certified soft summer that the colour was a tad darker and more saturated than she needed (the top is probably a dark winter or dark autumn hue). Claire added a perfect soft summer scarf and voila, the 90/10 rule and the outfit is a complete success! Wow. What a revelation. We had finally worked how to communicate a way to help our clients look (almost) perfect in an imperfect world. The 90/10% rule worked in multiple directions as long as we kept the colours (including the inherent colouring of the client themselves) connected enough to trick the brain into accepting the ensemble as ‘good enough’. We had to make sure our “cheats” still strongly referenced the client’s tonal character. This is why TCI doesn’t recommend a “second best tone” – because colour (and human beings) are more interesting than that. You can read more about why we don’t promote the ‘second best’ theory here “THE LEANING TONER“. 1/ Respect your own colouring first and foremost. You always form the basis for your best colour choices. 3/ Get to know the adjoining tones (the tones either side of your home tone) and understand what similarities and differences you each have. Become familiar with the colours in your adjoining tones that have most in common with those found in your home tone. 4/ Get to know the non-adjacent tones that are related to your home tone – the tonal spaces that have something in common with yours. They are often one step removed (either side of your adjoining tone), they have one of the same ‘parent’ tones e.g Bright Winter and Light Summer, and very occasionally they are found opposite each other e.g. 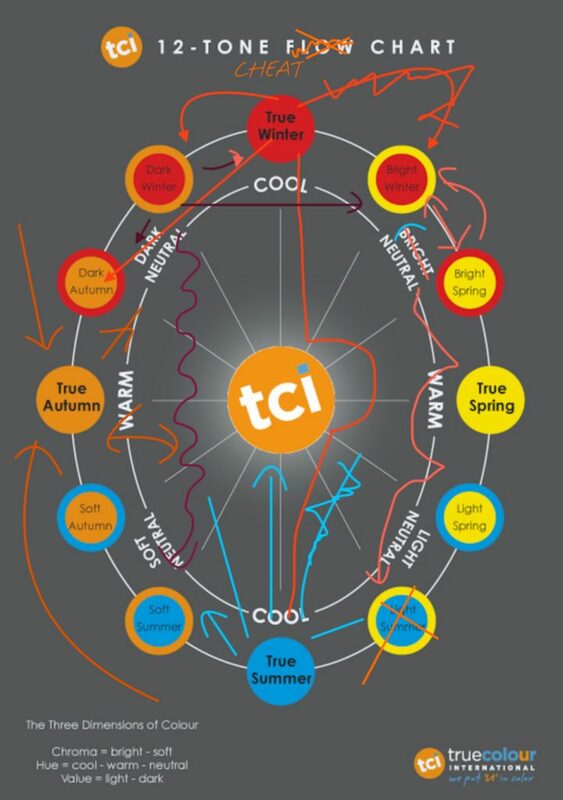 True Autumn/True Spring, True Winter and True Summer. 5/ Select cheat colours very carefully. Not every hue in every adjoing, related or opposite tone will work equally. Choose cheat colours that have the most in common (look the closest) with your home tone. The more in common, the better they will work: colours that could “almost” be on your own palette. 6/ Keep the 90/10% rule in mind. 90% hitting the spot and only 10% a little off and you will still look pretty darn good. 7/ If you find the perfect item/s, grab them. Better yet, grab two of them, and let everyone else know where you found it.